According to Frontline, immigration detention facilities have held an average of 30,000 detainees per day since 2008. 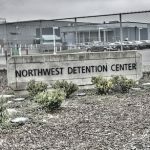 KBCS’s Jim Cantu spoke with Ashley Brown, a mother whose husband of ten years is being held in the Northwest Detention facility. She describes how her husband was detained by ICE agents as he stopped to buy breakfast on the way to work, and how his detention impacts her family.